Notes: Requires 3.90:1 axle ratio, heavy-duty automatic transmission, 7400-lb. GVW Package. Manual transmission maximum tow limit is 7500 lbs. with 3.55:1 axle ratio. Club Cab tow ratings are 8400 lbs. (automatic transmission) and 6900 lbs. (manual transmission, 3.54:1). Maximum tongue weight 900 lbs. According to Dodge, the following tow ratings are for normal conditions of temperature, grade and altitude. Extreme conditions will require selection of a higher axle ratio or a larger engine. 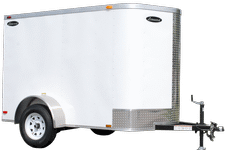 Maximum trailer weight ratings include cargo and fluids in the trailer and must be decreased by the weight of optional equipment, trailer hitch, cargo in truck and passengers other than the driver.